Have you noticed scaly and itchy skin on your hands, feet, or behind your knees and elbows? Do you have embarrassing, recurring rashes? 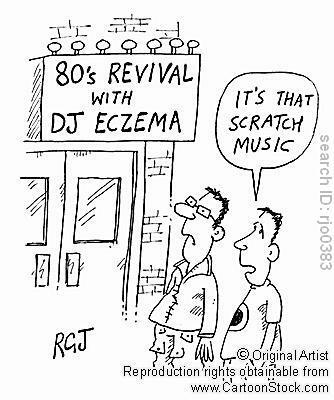 Well, you might want to ask your doctor if you have eczema. Eczema is a skin condition, more common in infants and children, that causes itching (sometimes called the “itch that rashes” because itching comes first) (A.D.A.M Inc). Eczema is usually referred to as atopic dermatitis. Usually eczema is caused by lacking certain proteins in the skin. The lack of proteins cause the skin to become red and inflamed, dry and blistered, and painful or itchy. Also, the age of the infected person can determine where the rashes will occur. So, in infants, rashes are usually found on hands, face, scalp, and feet. On anyone older, rashes usually occur behind the knees and elbows, neck, hands, and feet. There is no cure for eczema, which is a bit disheartening because the symptoms are more embarrassing than anything. But, its symptoms can be treated! If you do have eczema, explain why your skin reacts this way to your friends and family. The more you talk about it with people you know, the less self-conscious you will be. Also, it is so important to bathe briefly (to cleanse the skin and have as little contact with water as possible) and then moisturize as quickly as possible. The National Eczema Association recommends you use Cetaphil, but I say Aveeno is good too (they have a moisturizer specifically for people dealing with eczema). There are different baths a person can take, to help reduce symptoms: bleach, apple cider vinegar, oatmeal, baking soda, bath oil, and salt baths. For measurements on water and soluble content, refer to The National Eczema Association. Some doctors say that doing the bathing/moisturizing process right before going to bed is best so that more moisture is retained. There are also prescriptions drugs that people can take to help reduce symptoms, but knowing the basics of bathing and moisturizing, and combining the two, definitely help lessen irritation on your skin. If you have eczema, know that you are not alone! There are support networks, kids’ camps, and many doctors willing to help youth with eczema. And learn to take extra care of your skin!! !